"Russian saber-rattling is aimed at intimidating global public opinion. The idea is to make the world believe in the determination of Russia, which, to achieve its political ends, will not shrink from the use of nuclear weapons. 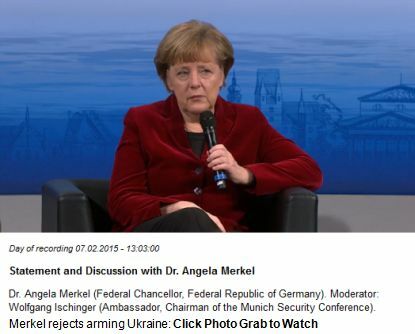 … Chancellor Merkel's declaration in advance that she opposes arming Ukraine is political suicide for the European Union as a political entity. ... Whether the West will respond in kind to Putin's threat to use nuclear arms is an open question. What's certain is that if Western politicians behaved like Mrs. Merkel and Mr. Hollande after WWII, today's world would be one big Soviet Union." Global security is threatened not only by Russian aggression in Ukraine, but its violation of the nuclear taboo. Russia, a country with the world's second largest nuclear arsenal, hasn't renounced the first use of nuclear bombs or missiles. Thus, for the first time since Hiroshima and Nagasaki, a nuclear power has incorporated as part of its military doctrine, the principle of freely using that most terrifying of all weapons. Let us recall that during the 45 years after the Second World War, the two major powers - one of which was the Soviet Union - declared their intention not to be the first to use nuclear weapons. It was a military-political ABC of the contemporary world, confirmed by a number of disarmament agreements concluded between the Soviet Union and the USA. Not only that, there was worldwide civic pressure against use of the atomic bomb, and any country that violated this principle was collectively condemned. At one time we took with a grain of salt songs such as the famous Let there always be sun, let there always be sky, let there always be Mom, let there always be Me [supposedly the words of a child wanting peace]. This song of Soviet propaganda, like the global peace movement, not only served to limit the West's freedom to use the atom, but tied the hands of Soviet authorities as well. That atmosphere, full of forewarning and condemning the use of atomic or hydrogen weapons, fulfilled its role on a number of occasions. Let's not forget that in the early 1980s, Soviet radar, confusing a flock of birds with rockets, mistakenly registered a large number of American missiles headed in the direction of the Soviet Union. It was a period of high tension between the two blocs. Fortunately, the Soviet colonel on duty that day didn't immediately forward the information up the chain of command and instead waited for confirmation – thereby violating all regulations. Thankfully, he saved the world from nuclear war. Alas, today the atmosphere which made this possible is gone. On the contrary, now even mass culture, in both science fiction movies and books, is dominated by images of the world after nuclear Holocaust. I wouldn't overestimate the significance of this, but it's hard not to notice. 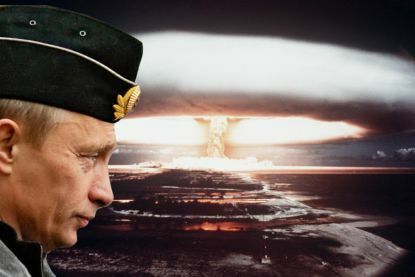 It is especially difficult now that Putin's Russia, having established its new military doctrine, has introduced the principle of the free use of nuclear weapons, depending on military necessity. It also adopted, contrary to international agreements, a new type of missile [the S-500 Triumfator] characterized by great maneuverability and with a range of 500 to 3,000 kilometers. They have been deployed in the Kaliningrad Oblast, putting all of Europe within its range. At the same time, to show Russia's determination to use these weapons, military exercises are being regularly conducted involving the use of these mobile battlefield missiles armed with nuclear warheads. In addition, bomb and missile-laden combat aircraft patrol the borders of NATO. These exercises and the new military doctrine are borne out of complexes originating in the 1990s. Russian saber-rattling is aimed at intimidating global public opinion. The idea is to make the world believe in the determination of Russia, which, to achieve its political ends, will not shrink from the use of nuclear weapons. This method gets results, with Russia now close to dominating Ukraine. E.U. countries that don’t have interests that conflict with Russia want peace at any price. As a consequence, as Gazeta Wyborcza said recently, we are close to replicating the 1938 Munich Agreement with Ukraine as the subject. There, in 1938, Czechoslovakia's liquidation wasn't agreed to – only the annexation by Germany of its territories with German-speaking majorities [the Sudetenland]. The brings us to the question of when, finally, Ukraine will yield to Russia and agree to a status shared today by the countries of Lukashenko [Belarus] and Nazarbayev [Kazakhstan]. If Mrs. Merkel's option wins out, the current president of Ukraine is headed for disaster. If the principle that the West will not arm Ukraine is adopted, the country is doomed to be absorbed by Russia. In such a situation, America is the last hope of Ukraine. President Obama is no Reagan, and if he accepts Mrs. Merkel's plan and doesn't arm Kiev, then unfortunately much of the task Putin has set for himself will have been accomplished. After that, efforts will likely begin to subjugate the Baltic States. Let's not forget that after every smuta [a time of troubles] - and current times are considered as such - Russia returned to her former borders and influence. Today the West, despite America's overwhelming military advantage over the rest of the world, is incapable of decisive action. It lacks the spirit of unyielding determination shown by post-war Western leaders. Take note that neither NATO nor the E.U. have recognized Russia as an aggressor and remain content with the newspeak of calling the aggressor "separatists." The West has yet to punish Russia by excluding her from international sporting, scientific and cultural events. Hence aggression is painless for the Russians, even as they delude themselves into thinking that a strong actor can do anything and that the propaganda their media weaves is true. Not even a mention has been made of excluding Russia from sporting competitions, which is a gesture to which Putin and the Russians are particularly susceptible. It has even been agreed to organize a World Cup football championship in Russia two years from now. If it occurs it will be a shameful event! And in European championships, none of the aggressor's teams have been excluded, as occurred after the 1968 invasion of Czechoslovakia. It is a similar story when it comes to cultural and scientific exchanges. In all, no restrictions have been placed on citizens of a country that annexes provinces of a neighbor with impunity and murders its inhabitants. As long as Russia and its citizens sense no international condemnation, it will be impossible for soft sanctions to affect Russian behavior. Today, neither President Putin nor his Foreign Minister Sergei Lavrov are treated as pariahs, but rather as statesmen. 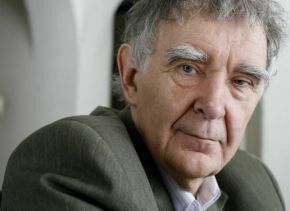 Their political counterparts aren't deterred by the lies the two propagate like Stalin Prosecutor General Andrey Vyshinsky or long-time Soviet Foreign Minister Andrei Gromyko. The West has yet to show it doesn't fear the aggressor. Chancellor Merkel's declaration in advance that she opposes arming Ukraine is political suicide for the European Union as a political entity. The recent negotiations in Minsk demonstrate that this is a road to nowhere. No one takes seriously promises of ceasefire. 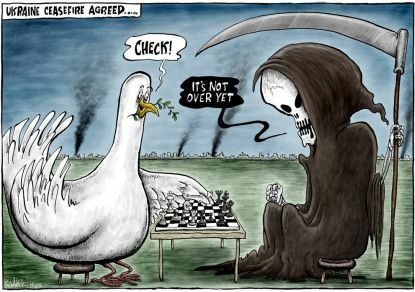 Since the talks held in September Russia has shown itself willing to break any agreement. Under the circumstances, the only thing to do is wait for the U.S. to put a stop to Putin's aggression. The question is whether he'll be told that after crossing the line of demarcation NATO will send its troops to Ukraine, or in other words, that upon crossing the Dnieper River the Russians will meet Western troops. This is essential to the preservation of the country's independence. Whether the West will respond in kind to Putin's threat to use nuclear arms is an open question. What's certain is that if Western politicians behaved like Mrs. Merkel and Mr. Hollande after WWII, today's world would be one big Soviet Union. What is happening now is a hideous capitulation of the West and democracy. If NATO and the European Union in the end yield to Putin, a genuine tragedy will ensue in which, in light of the inevitable emboldening of the Kremlin, will threaten the security of the entire world. It is regrettable that the only thing Moscow respects is naked power. It is terrifying that Russia has broken the nuclear taboo with such impunity. The world's desensitization toward the use of nuclear weapons, which is happening right before our eyes, is in itself a threat to the existence of human civilization.